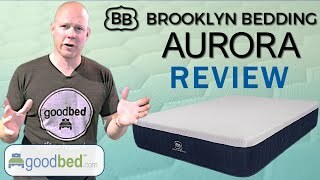 The Brooklyn Aurora mattress has many features intended to prevent overheating, from gel and copper infused foam, to phase-change cooling fibers on the cover and top layer. But is it the right mattress for your needs? The Brooklyn Signature mattress strikes a blend between new (with gel-infused foam) and old (pocketed steel coils) to achieve the best of both worlds. But is it the right mattress for your needs? Offering six distinct configurations, the Rubix is the most customizable sleep solution on the market. Using three interchangeable foams within one zippered Euro top enclosure, you can easily rotate or combine layers to achieve the comfort, firmness, and depth of support that’s just right for you. • The Rubix comes with three 2” Energex™ foams—each foam features a different level of firmness, ranging from soft to medium to firm. Pair any combination of two foams in our unique zippered Euro top to create your ideal sleep experience. • Each patented layer of Energex™ is an energetic alternative to conventional viscoelastic foam that couples all of the pressure mapping of visco with the responsiveness of latex. • A 1.5” quilted comfort surface layer promotes greater airflow for a cooler night’s sleep. • A 2” intermediate layer of foam offers a gentler transition to the firmer, high density base foam. • A 6” core of up to 1,024 individually encased Ascension™ coils provides unparalleled support, coupled with superior motion isolation. • A 1” high density foam base adds durability to the mattress while reinforcing individually encased coils as they compress. • Delivered in a box, allowing for easy transportation from your door to your bedroom. Is Rubix the right bed for you? Mattress fit is personal. This mattress type is an ideal match for 25% of people. Are you part of that 25%? Take the match quiz to see whether this brand is right for you. Bottom Line Is this a good bed for you? Do you have a Brooklyn Rubix mattress? Write a Review! There are no reviews on GoodBed for the Rubix yet. Be the first. Have a question about the Rubix? Which mattress from Brooklyn Bedding is best for you? Before shopping at Brooklyn Bedding, take a short quiz to find which of their mattresses best matches your unique needs and preferences. Powered by GoodBed’s intelligent matching technology, you can even get your personal match score for each of Brooklyn Bedding's available mattresses, in addition to other online options that match your criteria. The Rubix is a euro top spring core medium mattress model that is manufactured by Brooklyn Bedding. Have an update or correction to our information about Brooklyn Rubix? If so, please take a moment to suggest an edit. Rubix mattresses sold by Brooklyn Bedding come with a 120-night in-home trial. No return or exchange fees. Brooklyn Rubix mattresses are only available online or through Brooklyn Bedding stores. Click here to check for a location near you.